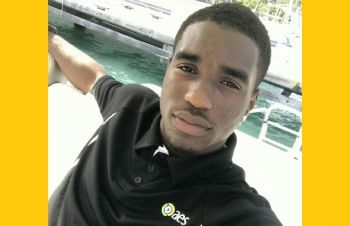 Makeem M. Hastings is a 20 year old Service Manager at Alternative Energy System (AES). He hails from Brewers Bay, Tortola. His job responsibility includes ensuring that home and business owners' generators are serviced on time and operating smoothly. Having the opportunity to learn and work with Solar is what he enjoys most about his job. "At first I didn’t know or fully understand much about solar but as I continued to learn, I have come to love and fully understand all the benefits solar provides, and just being able to share that with other people makes me happy," expressed our young professional. Prior to working at Alternative Energy System, Makeem worked as a construction worker and learned to build a house from the ground up. He said, "I would mix concrete for the experienced masons and just help keep the work site clean. This job is where I learned to put up a block wall on my own." Although our young professional desired to be a boat captain as a child, he has grown to love his current job working with solar energy and believes God has placed him in that position for a reason. He admitted, "My true, true desire as a kid growing up was to be a boat captain but I’ve grown to like the work I am doing a lot and feel like God has placed me in this field for his own reasons." Asked what would have pointed him in this field of work, our young professional said that he followed in the footsteps of his dad, Myron C. Hastings who would fix things around the house. "Growing up I would always watch my dad work on and fix family vehicles and things around the house on his own, just being the family’s mechanic or handy man and then I knew I always wanted to be just like him. Working with my hands and working with generator engines and solar panels is a perfect fit to learn many different handy skills," said Makeem. Our young professional was a proud member of the Enis Adams Primary School. Makeem then attended the Elmore Stoutt High School (ESHS) before moving to the H. Lavity Stoutt Community College (HLSCC) where he is currently pursuing an Associate's Degree in Marine Technology. Makeem disclosed that he attended a training course in Miramar, Florida for two weeks in July 2017 for power generation. The path to success for our young professional does not stop at being a Service Manager. He intends to start a trucking business with his father, while expressing that he wants to own a solar energy company. He pointed out that he wants to encourage the Virgin Islands government, home and business owners to use more solar energy, which will help them to save money. "My ultimate goal in this industry is to one day run my own solar company and most importantly to get the BVI government to work harder on getting the rules changed to encourage home owners and businesses to get solar for themselves and be able to net meter into the BVI Electricity Corporation (BVIEC) grid. The BVI is way behind on this and we can help the BVI save a lot of money," he said. Our young professional stated that he loves the ocean and goes sailing when he gets the chance. "I really love the ocean and I like to go sailing from time to time. I feel like if you live in the BVI, being on the ocean should be second nature," said Makeem. In a time when young boys are in need of male role models, Makeem disclosed that his father, Mr Myron C. Hastings, his manager Chris Fletcher and Honourable Melvin M. Turnbull (R2) are his inspiration. Giving some advice to his fellow youth, Makeem encourages them to work hard and stay focused. "Keep your head on and don’t be afraid to dream. Having a dream is very important because you get up everyday wanting to achieve it and don’t keep them to yourselves. Tell someone you can trust in the community. Trust me, a lot of them are there to help in anyway they can once you put your first foot forward and show you are determined 'People help people who help themselves' is a very true saying." It's so good to read this at this time! A young local doing great things and being so positive. 20 and reaching for the stars, good stuff. When Makeem makes a goal, it's as good as done. Good job! This is amazing !! Keep up the good work Makeem!! Shoot for the stars meh boy. Anything is attainable under the sun. Dont know you young man. Proud of you. God bless. Yea big dawg Great pick VINO this is the definition of a young hard working young man his parents should feel proud. I've known you from time your mom was pregnant with you. I am proud of the man you become. Keep reaching the stars Makeem and try to encourage young men in the community as well. How refreshing to read this after all the terrible headlines and senseless deaths. Other young men should follow in his path instead of heading down the thug path. Good for Makeem, I'm sure he will be a successful young man. Sounds like he had a good role model in his dad too! Wish him all the best in life. I am very proud of you Makeem, do continue the great job your doing. Can't wait to see what your doing at age 30. Keep your head up high my love. Good luck to you and continue to stay positive and focus. This is a complement. Hé is one handsome young man. Makeem great work especially right now when so many of our young men are dying without any knowledge of what they want to do with their lives. Go Makeem!!! You are LOVED and BLESSED!! May God continue to keep you on the path of goodness towards your greatness!! Cant wait for you to help me with my energy solutions in the future! !So PROUD of you!! Makeem is a young man that other young men can look up too. He is one of the best. Wow like at my Pre school student , go Makeem the sky is your limit. I am so proud of you my son. Please keep your head up and always stay positive. You are on the right road to success, may God continues to bless you to receive all what you want in life with good health. Nuff respect. Wow! I'm so happy to be reading this article. So refreshing to see a young man hard at work doing something positive & not in the streets trying to be something that he's not! So proud of you Makeem. So glad to see that you have your dreams & goals all figured out & I pray you continue to stay on the right path. Some of our young men can learn a thing or 2 from you!